In this newsletter, we wanted to offer an educational feature related to disaster scenarios we have encountered when responding to a variety of fires, floods, tornadoes, hurricanes, or mold exposures. This is a challenging subject to talk about because these scenarios are usually very serious events that not only bring about health and safety risks, but also present a wide range of stressful, timely, and daunting situations and decisions for all those present. That being said, it is important to reflect upon these scenarios and learn from them. The Center has been involved in hundreds of disaster response scenarios over the last 33 years, and we wanted to share a few recent disaster response stories that impart how incredibly rewarding and humbling this type of preservation work can be for all who are affected and involved. Late on a Friday afternoon, The Conservation Center received a call from a restoration company requesting immediate assistance in Hattiesburg, Mississippi. Hattiesburg is a small town of about 50,000 people in southeastern Mississippi; the town had recently been the victim of a deadly tornado. 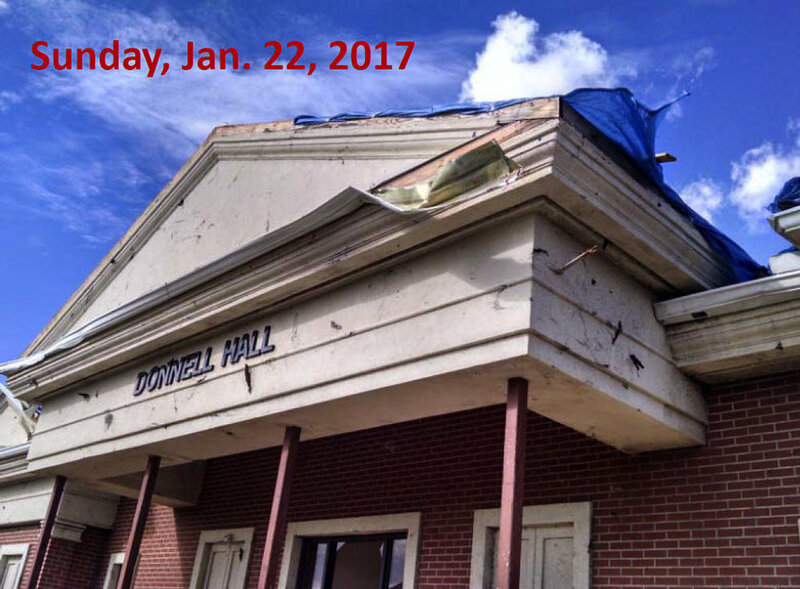 An EF3 tornado tore through Hattiesburg on Saturday, January 21, 2017 leaving four people dead, many injured, and hundreds without power or water. With wind speeds of 135 to 165 mph the tornado ripped up trees and street lamps, buildings were torn apart, cars were flipped, and homes were destroyed. "Once we had established that the building that housed the collection was structurally stable, my next concern was humidity and water damage. It had been raining heavily, and while we were told there was no evidence of mold or water damage, the contents of the collection varied greatly in media and some pieces were more sensitive than others to the moisture levels. I knew that we needed to act very quickly to avoid any long-term damage." Click above to watch 4k Drone Footage of the path of the Tornado that carved a path through Hattiesburg 1-21-17. "Nothing could really prepare us for what to expect when arriving in Hattiesburg. The devastation was shocking. Our fear was thinking this collection was severely compromised and we prepared ourselves for a major triage situation. Thankfully, Donnell Hall was able to withstand the weather and we were able to quickly and safely retrieve the artwork for treatment and storage." Fortunately, the University had meticulously inventoried their collection prior to the damage and our Registrarial Team incorporated their records into The Center’s on-site inventory process. While most of the collection appeared stable, The Center’s Senior Framer, Toby Joyce, was on-site and went through the entire collection with Professor Bennie Crockett, Th. D., Ph. D to determine which pieces needed immediate treatment. Over thirty pieces were identified to have their housing materials replaced due to water damage and these pieces were transported back to The Center and treated immediately upon arrival. The remainder of the collection, approximately 260 pieces, was swiftly removed from the building over the course of four days. Using our large network of professional art handlers, we located a local climate-controlled art storage facility with the appropriate security for this one-of-a-kind collection. The collection was housed at the facility until the renovations on Donnell Hall were complete. The collection was recently returned and installed into the new space. The team worked tirelessly from the initial on-site images to install every object perfectly from the pictures. "My highest compliment is quite simple, yet to the point: we trust The Conservation Center with our internationally acclaimed collection, and we are grateful to The Conservation Center for giving the Carey Center new hope." At 5:30am on Saturday, March 4, 2017, the owner of a private estate in Pennsylvania was sharply awoken by the blaring of his security detectors. After falling asleep in front of his first floor fireplace the evening before, he had awoken at 2:00am to retreat to his bedroom. Before ascending the stairs, he noted that all the wood burning in the fireplace was reduced to ashes. "Moving quickly, we communicated with the restoration company to understand the scope and scale of the collection and the damage it had recently sustained. Once this information was gathered, we immediately began to work internally to decipher the appropriate number of team members to send onsite, as well as what supplies would be needed. By early that afternoon, our flights were booked." At 8:00am on Sunday, March 5, less than 24 hours after receiving the initial call, a team of five team members with over 30 years of collective experience were on a plane headed for the estate. Upon arrival, our team was greeted by the restoration company before being immediately ushered in to speak with the owner of the home, art consultant and appraiser, property adjuster, and broker. Each claim is different, and at The Center our years of experience grant us the ability to understand the variety of nuances we may encounter when entering a job site. In this circumstance, we were fortunate to be afforded a meeting very early on with all parties involved. They emphasized that the collection was very important to the owner, and several of his most prized pieces were in the room where the fire started. They explained to us that the fire had begun near the first-floor fireplace, and burned through the floor to the basement below. Luckily, the fire was caught early enough and was contained. However, the house had filled with soot and strong smoke odor throughout. Our team did a full walk through of the home first with the owner, then his art consultant and appraiser. We listened while they explained which works were most important to them, as well as narrated the history and care that was given to each piece by first the artist, then the consultant, and lastly the owner. They dictated which pieces were to be removed and transported back to Chicago for treatment, and we carefully made note of them during the tour. When pieces of art have been exposed to fire, soot, and smoke, treatment can be very time sensitive. Soot is acidic and can create permanent, long-term issues if not addressed in a timely fashion. In Pennsylvania, our team’s first priority was to remove the collection as safely and quickly as possible so the soot exposure and smoke odor did not further affect the works. In this case, fortunately the fire had been contained and mitigated in a timely and efficient manner, so the artworks were only lightly exposed. This being said, materials such as canvas can easily absorb a smokey odor, locking in a smell that can be very difficult to eliminate. Our team carefully packed each work in a custom-made shadow box, taking photographs that correlated to an inventory number for each piece onsite. We stayed in close communication with our team of conservators, art handlers, and administrative staff in Chicago, frequently sending an inventory count and pictures to ensure they would be well prepared to receive the work, and complete any triage that may be needed when the collection arrived. Over a period of three days, our team inventoried and packed over 100 pieces. We then carefully loaded the collection into a climate-controlled truck, which two of our staff members would drive straight back to Chicago. On Thursday, March 9, less than a week after the fire, the pieces were safely stored in our Chicago facility and ready to enter the examination process. "Soot particulates are sharp and acidic in nature. When testing soot removal from paintings, we use a small swab with an aqueous solution to test whether the soot can be safely removed and the paint layer is not sensitive to cleaning solutions." After testing the various solutions, we were able to determine the best possible treatment for each individual piece of artwork. "As a local art consultant and appraiser, I was asked by the owner to weigh in on this emergency. Upon arrival I found The Conservation Center staff onsite and ready to do a comprehensive walk-through and assessment. My next step was to get out of their way as they went into action. The staff's competence and professionalism was clear and reassuring to the owner and myself. The Center's staff inventoried, packaged, and loaded out the artwork with timely, skilled precision." Additionally, because we were aware that the collection was so valuable to the owner, we provided additional treatment options that were not claim-related. Ultimately, the owner would select to move forward with upgrades for the entire collection that addressed age-related condition issues that were present prior to the fire. Museum quality framing and UV-filtering glazing were also added, allowing the owner to receive his cherished collection back in even better condition than it was before. While we are grateful we were able to share these scenarios with you, there are many more every year we cannot share due to confidentiality reasons. We continue to strive to make others aware of what is possible in the amazing art conservation industry as we develop new materials, techniques, and protocols to treat conditions prior never thought possible. We also think it is vital to expose the human factor of these scenarios, which in many cases can offer life learning lessons. It is amazing to watch people under pressure rally together to make something important happen, especially when the stress of accuracy and experience counts. Like in any other industry, in the field of art conservation years of experience can make all the difference. The depth of one’s experience not only allows for a level of awareness and confidence, but also serves as a critical reminder of how precious the decision making process is when any given moment can be a turning point. When entering into such circumstances, it is natural to instinctively feel overwhelmed. Experience allows you to process the situation, prioritize, and work under pressure effectively. With a team accustomed to working together, amazing results are possible, and a collective energy develops that is palpable. Once the pressure of the situation clears, it is beyond rewarding to see that we have saved so many precious art works for future generations. Creating trusted relationships with niche service providers in advance of a negative situation can be pivotal to altering the outcome of the disaster response scenario. On a daily basis, The Center answers questions and offers outside guidance regarding disaster response options because we have witnessed over and over again how timing is crucial. Having access to people you trust and making swift and healthy decisions are key to recoverability. Sometimes a tough or negative experience can lead to positive lessons learned so that you are prepared and well tooled to deal with, as best as possible, unpredictable future events.